As a warm up for reading this blog, please say the following five times as quickly as possible: The Fatherly Figure in Fantasy. I shared some thoughts on Left Coast Voices regarding Father’s Day this Sunday. But it occurred to me that the father figures in epic fantasy gets a tough time. Here is a brief overview of a few of our beloved characters and their fathers (I acknowledge that I am encompassing a wide definition of the genre for this post. Purists – please excuse me this once). WARNING: There might be spoilers here, so I am giving the name of the character first and won’t be offended if you skip that part. I know this is sci-fi and not fantasy, but we have all hung there with Luke as his father, who had just chopped off his arm, now looms over him with a lightsaber. What a time to discover your father! As if it is not enough that your uncle and aunt who brought you up were murdered, now you discover your father is a metallic mass-murderer. Suggestion: Do not buy Dad a lightsaber. It is the first step to the Dark Side and he already has plenty of power tools he never uses. So your father abused you and openly hated and insulted you. As if you don’t have enough to contend with two older, beautiful siblings, who are bonking, or the fact that you were born stunted and are accused of killing your mother as she gave birth to you. 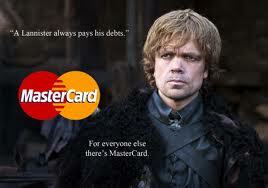 Not hard to understand why A Lannister Always Pays His Debts! Suggestion: Don’t give your father a ‘quarrel’ even if he deserves it. Also grew up never knowing his true father and then, like Luke Skywalker, finds his uncle, who was like a father to him, is murdered in his stead. Of course, no sooner does he discover who his father really is, than he has to bury him, and take considerable blame for brave father’s death. Suggestion: Giving your old man your dragon/porche just before he dies is classy, but do check your insurance policy first. Gotta give the dark elf considerable credit. 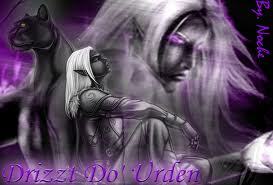 He grew up in the Drow city of Menzoberranzan. where all males were merely fighters and concubines. Of course his mother and sisters abused him and tried to kill him, and by the time he discovered who his father really was, well…I don’t think he even got to bury him. Suggestion: a bit stumped here. When your father gave you a genetic sense of justice, enough to turn you against your mother and sisters, what can you really reciprocate with? I admit, I had to look this up and cannot guarantee my sources. Frodo’s father was Drogo and we don’t know much about him other than he went and drowned in a boating accident. Hobbits should know not to participate in such dangerous and adventurous pastimes as boating. At least, Frodo had a nice secure upbringing with his first cousin once removed (and not his uncle as even dear Bilbo often referred to himself). It was not as though Bilbo passed on any artifact that was incredibly dangerous and held the fate of the entire Middle Earth! Suggestion: Stay away from the jewelry!!! In epic fantasy we gravitate to protagonists who are the underdogs, who overcome adversary, and make great personal sacrifice. But we also seem to be sending out a message to our young readers that the absent/weak/villain father is the norm. It must not be so. Every young man deserves a father who is a role model, imperfect and flawed as we may be, but a father who will teach him to fish, nock an arrow, believe in a just society, and to be a good human being…or elf…dwarf etc. I’m sure if we were to meet Luke, Eragon, Tyrion, Drizzt or Frodo in a pub, they would all agree that they wished they had fathers they could truly appreciate and learn from. Perhaps being the best father you can is the greatest quest any of us can embark on. 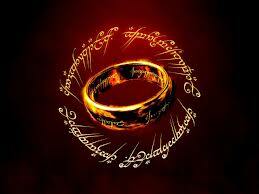 It may not save Middle Earth or Menzoberranzan, but it will make our world a better place to live in. Alon Shalev writes social justice-themed novels and YA epic fantasy. He swears there is a connection. His latest books include: Unwanted Heroes and the 2013 Eric Hoffer Book Award for YA – At The Walls Of Galbrieth. Alon tweets at @elfwriter. For more about the author, check out his website. This entry was posted in Humor and tagged A Lannister Always Pays His Debts, arrow, Ashbar, At The Walls of Galbrieth, Bilbo, Brom, dark elf, dark side, Darth Vader, dragon, Drizzt, Drizzt Do'Urden, Drogo, drow, dwarf, dwarves, elf, epic fantasy, Eragon, Eric Hoffer Book Award, fantasy, Father's Day, fish, Frodo, Frodo Baggins, Game of Thrones, George R.R. Martin, Happy Father's Day.Alon Shalev, hobbits, human being, Inheritance, insurance policy, jewelry, just society, Left Coast Voices, lightsaber. light saber, Lord of the Rings, Luke, Luke Skywalker, Mastercard, Menzoberranzan. Concubines, Middle Earth, nock, Paolini, porche, power tools, protagonists, pub, quarrel, role model, Salvatore, Saphira, sci-fi, social justice, Star Wars, The First Decree, Tolkien, Tyrion, Tyrion Lannister, Unwanted Heroes, YA epic fantasy. An interesting look at fantasy fathers…until I read this, and started thinking about it, I hadn’t realized how absent fathers were in the fantasy world. Those that do appear are not, necessarily, the best examples or parental role models as this list reveals. I guess I take the other approach. I kill off the Mom. Gives the protag more background, never having the mother figure around to show them the compassionate side. Or in the case of female protag, the role model. Wonderful, fun article, and perfect for this weekend! Had to tweet and post on facebook. Thank you! Great article. It’s so true that in so many books, movies, etc.. the parental figures are either absent, evil, etc… We need more that uplift the important roles a mother and father play and to show those who don’t have those figures in their lives what a healthy parent child relationship looks like. Love the article, and how truly accurate. In my books, I try to vary it up a bit. There may be that villainous dad here, but there are strong older males who step into the void the others left. In many ways, those supporting characters are the unsung heroes of Aelathia, because without them, perhaps our protagonists may not be up to the task, so to speak. I also make sure to spread it around–for every absent/bad father there’s a mother out there with similar or different problems–and other women ready to fill those roles as well! In many ways, I believe that reflects real life. Some fathers and mothers ARE amazing, while others are distant, absent, or not worth emulating, but there are people willing to fill those latter roles to the benefit of the child, the single parent, and society. Great article, great thoughts! And good idea to avoid that jewelry. Thank you, Joshua. I hope it is a reflection of life: some good fathers, some bad, and the same with mothers. Knowing that my sons are so deeply invested in epic fantasy, and so trying to be a good Dad, it made me stop and wonder. I believe the reason father figures get so much crap is that they often wind up in the role of the mentor. In fantasy (and sci-fi for that matter) mentors are often there for the first third of the hero’s journey before passing on (sometimes violently) or turning out to be antagonistic towards the hero. Fathers, as in real life, can be heroes or villains. That positive or negative role leaves a lasting impact on the hero, shaping him into what he becomes. As do many of our own fathers, I think. Thank you for the feedback and insight, David.